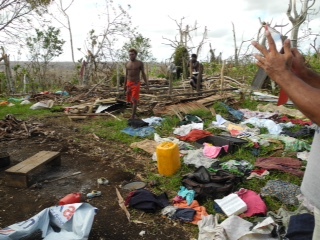 Disaster Aid International has deployed two members of our Disaster Aid Response Team to Vanuatu. Wayne (USA) and Dianne Holland (Australia) arrived last Thursday 26 March. Following discussions with the affected communities and other aid organisations, the initial assessment has confirmed that the priority need is for clean water. A number of Sawyer filters have been distributed, each sufficient to keep a large family supplied with clean water for several years. The team is now assessing the most effective places to site Skyhydrants which will provide clean water for whole communities. The team are currently compiling their report but have sent back several photographs that give a good indication of the scale of the damage.